Total Glass Professionals offers you a choice of styles and designs to meet a wide range of tastes and budgets. 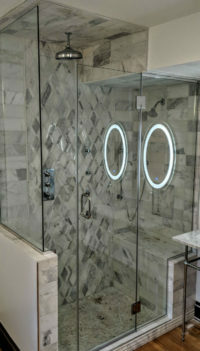 At Total Glass Professionals we offer a variety of options for Custom Shower Enclosures. 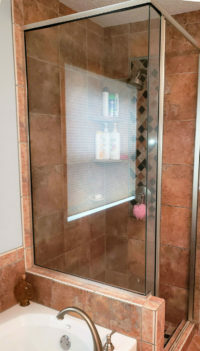 Framed Shower Enclosure – has metal around the entire structure. You have many options for glass types and frame finishes. 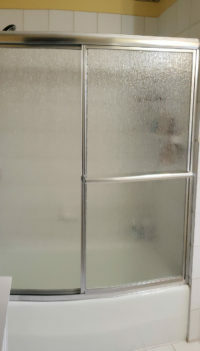 Semi-Frameless Shower Enclosure – has metal around the entire structure, but the actual door does not have any metal frame around it. The semi-frameless design features low profile framing with a solid glass door. When paired with the right glass texture and metal finish, the creative possibilities are endless. Frameless Shower Enclosure – may have metal (u-channel) around the fixed panels and it may even have a header for safety/support reasons. In order to qualify as being frameless, the glass thickness must be 3/8” or 1/2″ and the door must be attached by hinges only – no metal around the door. Full Frameless Shower Enclosures, with clips instead of channel, are very tough to make completely watertight. When you are opting to remove all the frame, it creates gaps between where the door meets the stationary panel and the door and/or panel meets the wall. We can use plastics/vinyl to minimize water leaking out, but there will be some water that will find it’s way out. 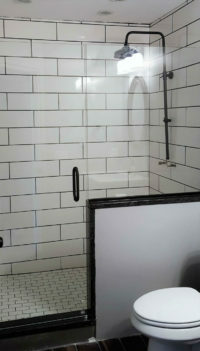 The plastics/vinyl can also distract from the clean frameless look of the shower. Frameless shower enclosures offer elegance and functionality to your bathroom. Available with 3/8 inch or 1/2 inch glass in clear or a variety of textures. We are certain to have just what you are looking for. 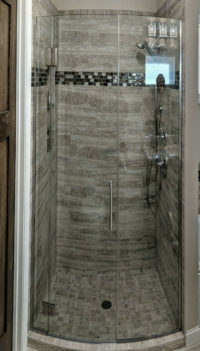 We can help create your shower, from a multi-panel enclosure to the simple single door. Improve any bathroom with the addition of a frameless glass shower door. 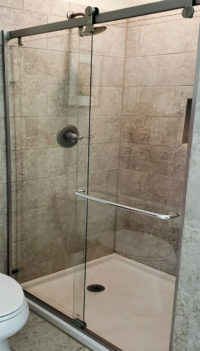 We make sure that your new shower glass doors provide continuity of design and update your bathroom. Total Glass Professional specialists will take precise measurements to ensure a perfect fit. We offer customers the options of installing semi-frameless, frameless and framed glass doors. 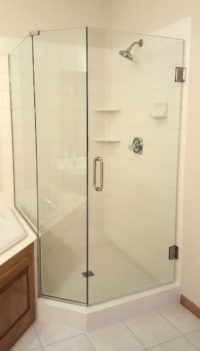 At Total Glass Professionals, we offer a variety of options for Custom Shower Doors. 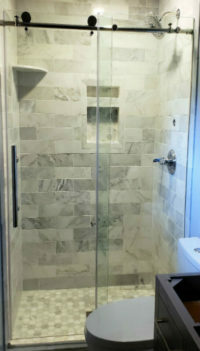 Semi-Frameless Custom Shower Doors – they combine framed stationary glass with partially framed doors. Or, in the case of single doors, a partially framed door is stabilized with metal framing on the hinge side and at the base, while the top of the door and the handle side have no metal physically attached to the glass. 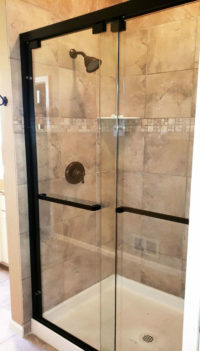 Frameless Custom Shower Doors – have metal header support atop the units, which is why the terminology can be confusing. Even with a metal header, these systems are still “frameless” because there is no metal between the panels or doors to keep them secure. It is a very low-profile metal channel at the base of the glass that performs this function. 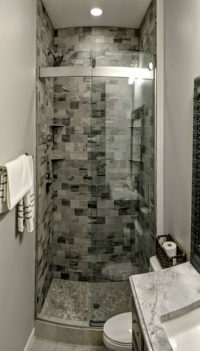 Framed Custom Shower Doors – framing refers to the presence of metal on individual panels of glass, not whether or not there is metal on the outer perimeter of the shower enclosure as a whole. This, understandably, causes confusion among customers who aren’t familiar with the industry jargon. 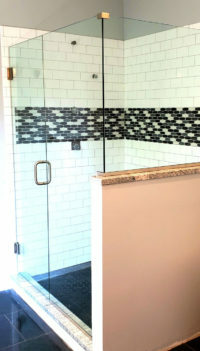 In short, framed shower doors consist of glass panels that are individually framed in metal, sliding or swinging within additional metal wall jambs and channel to create a finished shower enclosure. In the first picture above, for instance, the glass door has metal attached to the glass, and this metal is hinged to a metal corner post that divides the door from the adjacent stationary panel.